If any of you were born in the mid 1900’s (THAT sounds old!) you will absolutely know what tuna noodle casserole is. This comfort food graced every table in my youth in some form – usually that of canned tuna (not line caught, not wild), elbow macaroni or thin egg noodles (certainly not penne made from fine Semonlina flour) and cream of mushroom soup (from a can, naturally). School cafeterias served this, some called this “end of paycheck casserole” and it was kind of a go-to meal for many families. Oh, and some lucky kids had it served with crumbled potato chips on top! At my house, my mom must have prepared this from time to time. For sure it was an option for hot school lunches. Believe it or not, I sometimes get a hankering for the taste of mushrooms, tuna and noodles. But I’m happy to report that today, I have what I believe is a much better version. I even tried it out on my grandkids when they were in town. The verdict? Huge hit! Of course. Basically, this is an easy dinner with leftovers to boot. You make a white sauce, stir in sauteed veggies and spices, then fold this into cooked bowtie pasta along with high quality canned tuna and frozen peas. Crispy panko crumbs (available in most grocery stores in the Asian section) which have been sauteed in butter are added as topping during the final part of baking. Oh, and because my grandsons pick cooked mushrooms out of foods, my daughter had the brilliant idea for me to put the mushrooms in my Nutribullet and chop them to almost a mushroom paste. In other words, you end up with a mushroom taste without the visual look and texture of mushrooms. In other, other words, the perfect way to fool your kids (or adult sons, not that I am naming names…Daniel) who THINK they don’t like mushrooms. Butter or oil a 9 x 13 pan. Preheat the oven to 350 with the rack in the middle. Start a large pot of water to boil the pasta – add a half a teaspoon salt. When it is boiling, add bow tie noodles and cook until al dente but not totally soft. Drain well. Meanwhile, (noodles can be cooking away) melt butter and sauté the diced onion, celery, pepper and mushrooms or mushroom moosh. When everything is soft, sprinkle with flour. Stir and cook about three minutes. Continue stirring then add heated milk slowly until it makes a thick sauce. Cook another minute. Turn off the heat and add the dill, drained tuna, and frozen peas, salt and pepper Stir to combine and taste to see whether you might need additional salt or pepper. Scrape everything into the prepared baking pan and bake uncovered at 350 for 20 minutes. While the tuna casserole is baking, heat the 1 ½ Tbsp of butter in a small fry pan on medium heat, add panko crumbs and stir until they get a little brown. Remove from the heat. After 20 minutes pass, remove the baking pan from the oven and top with browned panko crumbs and bake an additional ten minutes. Remove the pan from the oven, let it rest about ten minutes and serve with a nice fresh fruit salad and green salad. Cook’s note: this is also good if you prefer leftover or canned salmon or even cubed chicken/turkey in lieu of tuna. 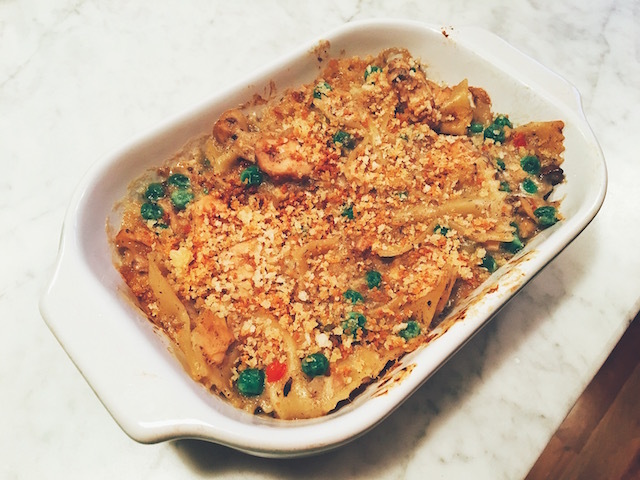 This entry was posted in Fish & Seafood, Pasta and tagged tuna noodle casserole. Bookmark the permalink.